Can you believe it's been twenty-five years since the birth of Bowling For Soup? 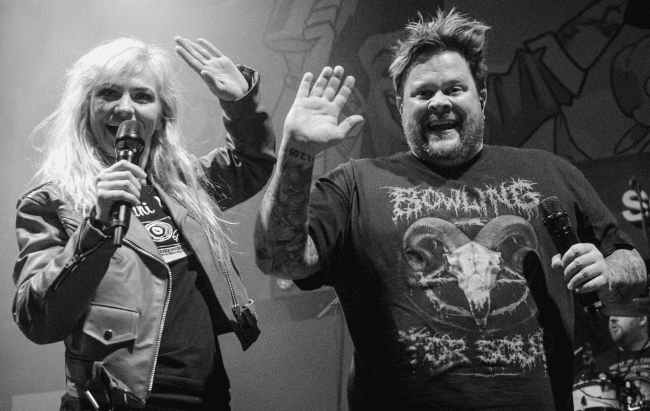 After many albums, countless shows, and much success, frontman Jaret Reddick has launched a new side project, Jaret & Kelly, which finds him teaming up with Kelly Ogden, lead singer of The Dollyrots. We caught up with Reddick to discuss Jaret & Kelly, their album Sittin' In A Tree, and twenty-five years of Bowling For Soup. They've done several tours together, covered each other's songs, and teamed up on the 2012 song "Love Ya Love Ya Love Ya," so it would only seem natural for Jaret and Kelly to put out a full-length album, which Jaret suggested one night while the duo were performing "Love Ya" live. However, it wasn't an easy process and it took several years to complete Sittin' On A Tree. There were Bowling For Soup tours. There were Dollyrots tours. Ogden had a baby during the process. When they could find time, they would meet at her home in Tampa for a few days or his home in Dallas to write and record. Was it worth it all that time and travel? One listen to the insanely catchy "Doin' Alright" will tell you it was. Because their schedules are still hectic and they couldn't be at the same place to create a music video for the song, Reddick found an animator on Fiverr to create the video. Another standout track on Sittin' In A Tree is "Daddy's Girl," which is one of the sweetest songs Reddick's every penned. In it, Jaret is singing from the perspective of a father while Kelly is tackling the daughter's perspective. "Daddy's Girl" was a very difficult song for the two of them to write and record as they were both going through major life events at the time: Reddick's daughter was turning sixteen while Ogden's father was dying. Recording the song was so painful for Kelly that Reddick had to make Ogden laugh so that she would be able to sing the song. While Kelly still can't perform "Daddy's Girl" live, Jaret's hoping one day that will change. To help promote the March 22nd release of Sittin' In A Tree, Jaret & Kelly have put together tons of items, from homemade cookies to a one-minute song about you, that fans can purchase. Jaret said a few folks have purchased the house party, but they've only had time to perform one so far. Sittin' In A Tree isn't all the duo has out right now. You can also hear them perform "Those Were The Days," the theme song to ABC's Schooled. Schooled and The Goldbergs creator Adam F. Goldberg was a fan of both The Dollyrots and Bowling For Soup and approached the duo, asking them to submit a song for consideration. Luckily, they were recording at that time and whipped up fifteen different themes for them to choose from. Even though they were going up against several heavy hitters in the industry, Jaret & Kelly's "Those Were The Days" was chosen to be Schooled's theme. With "Those Were The Days" and the Phineas and Ferb theme under his belt, Reddick may be on his way to becoming the Kenny Loggins of TV, a career he said he wouldn't turn down if it was offered to him. But Sittin' In A Tree isn't the only thing on Jaret Reddick's plate. 2019 also marks the 25th anniversary of Bowling For Soup, which Reddick would never have imagined happening in the early days The guys came from a small town, so they just started Bowling For Soup for something to do. There was no way he could see them still putting out music and still selling tickets to shows twenty-five years later. To commemorate the anniversary, the band will have a four-day celebration in Texas this summer. After that, they'll hit the road on a co-headlining tour with Reel Big Fish. They'll also have a few more announcements coming as the year progresses. In addition to the aforementioned extras you can purchase from Jaret & Kelly, Jaret also hosts several podcasts, so he is very accessible to his fans. We closed out our conversation with Reddick discussing artist accessibility. He mentioned that artists today have to always be accessible, that it's just part of the landscape. "People want to know what you had for breakfast," he said. He embraces it and would have liked to have seen that same type of accessibility from artists while he was growing up and would have loved to have heard podcasts from Nikki Sixx, Eddie Van Halen, or John Lennon.